... composed of light weight aluminium frame which enables easy maneuvering even for an adult care giver. the light weight wheel chair is easily foldable and transportable to any place. Stair stretchers are ideal when emergency professionals have to transfer patients down stair cases. The Plus model is equipped with track. PRODUCTS INTRODUCTION: Specification : 1.Super hard steel material commode. 2.Foldable design for easier transport and package. 3.Height adjust:48-53cm. 4.Seat width:45cm 5.Height from arm to seat:15cm. ... overall dimension, locking safety latch naturally releases when chair is folded. It made of light aluminium and with a waterproof nylon orange sheet, which has a pocket situated in the seat back. Easy to use while carry people in the staircases. For safety reason, there are two seat belts supplied. Strong skeleton is made of stainless steel. 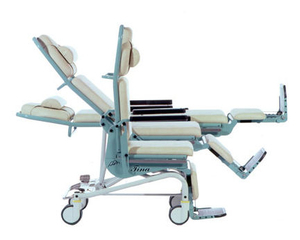 A transfer chair is a wheelchair for moving a patient from room to room. These devices are used primarily in hospitals and emergency departments to move patients who are weak or who have mobility problems. Such chairs are usually manual. Some are folding, with small rear wheels for compactness. However, they cannot be propelled by the patient. For increased comfort, certain models have backs that can be adjusted to accommodate patient morphology. Non-magnetic versions are be used to transport patients to the MRI room. Choice will depend on the chair's size, weight, maneuverability and how easy it is to carry and handle, all as a function of the area where it will be used. Keep in mind indoor versus outdoor use, the presence of narrow hallways and similar considerations.